It’s a while since I’ve been down to Portaferry, but I still have some photos from last summer’s trips around that end of the Ards Peninsula. So let me show you the townland of Ballymarter. The Quintin Bay Road leads to Quintin Castle, a fort dating back to the 12th century. The fort was built by the Anglo-Norman John de Courcy, who took control of eastern Ulster in 1177 and built a series of fortifications (including those in the townlands of Ballykeel, Holywood and Church Quarter, Dundonald). 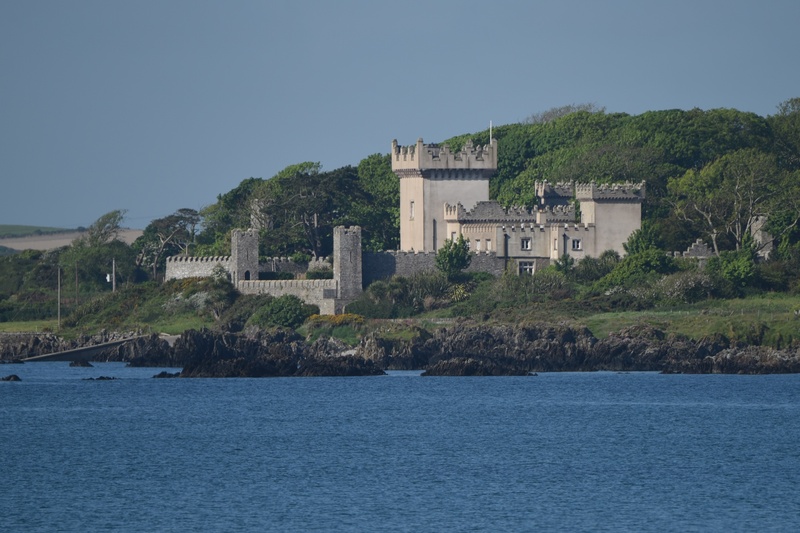 Quintin Castle has been through everything, left in ruins, restored by new owners, repossessed by the Irish government’s National Asset Management Agency (NAMA) and sold in 2013 to a firm associated with the owners of the Tayto crisp brand. They have applied for planning permission to convert it into a boutique hotel with a courtyard for weddings. I haven’t seen inside the castle, but I can tell you that the sea views round here are beautiful. Here are some images from the nearby shore, taken from the Knockinelder carpark, together with a suggested walk (also posted in my blog from Knockinelder). According to the PLACENAMESNI website, the origin of the name Ballymarter may be an Anglo-Norman family name, maybe Martel or Marter. There are other interpretations relating to the Irish word martra meaning “saint’s relics”, and the spelling on this monument suggests that some people connected it with religious martyrs. 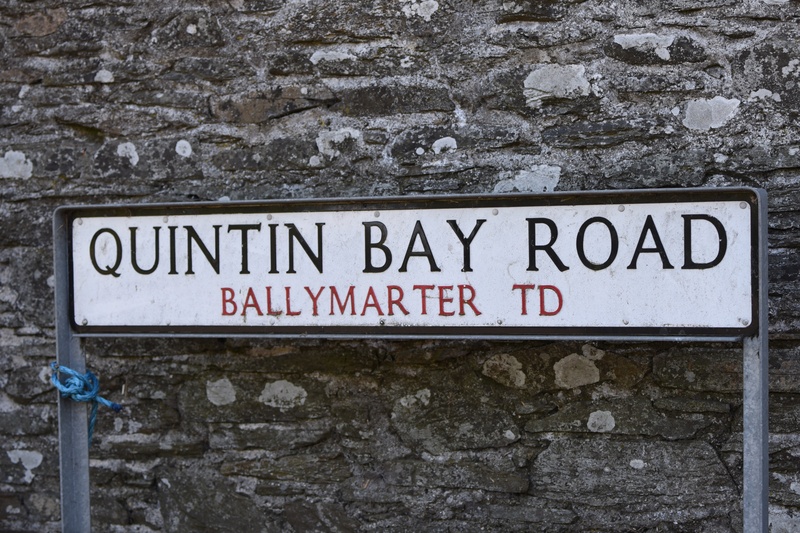 I have one more image today – a photo of this sign for the Ballygarvigan Road, the southern part of which skirts the northwestern edge of Ballymarter townland. If I don’t get back to this part of the peninsula for a while, at least the townland of Ballygarvigan has had a brief mention! Which townlands border Ballymarter? To the north, Ballyrusley. To the northeast along the bay, Knockinelder. To the south, along the coast, Keentagh. To the southwest, Craigaroddan. To the west, Ardgreehan and Tullynacrew. Click here to see a map of Ballymarter on Townlands.IE. 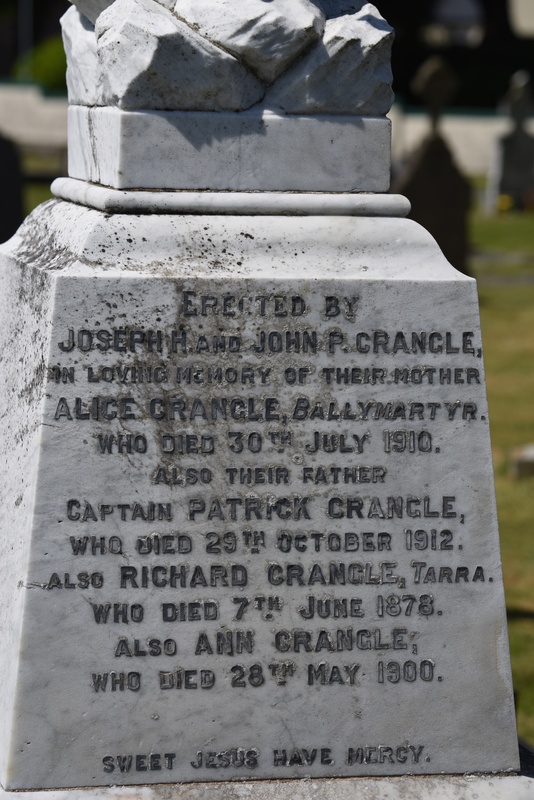 And finally, click here to read more about the townland name on PLACENAMESNI.ORG.